Strangford MLA Mike Nesbitt has said he is hopeful that his Ulster Unionist Party Colleague and Roads Minister, Danny Kennedy, could repeat the successful five hours for a pound offer that ran over the Christmas period. 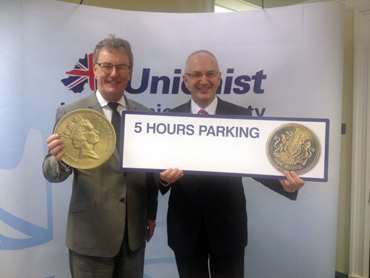 UUP leader and Strangford MLA Mike Nesbitt with DRD Minister Danny Kennedy promoting five for a pound. The Ulster Unionist Leader said: ‘In towns like Newtownards and Ballynahinch reasonably priced car parking is a great tool to boost local businesses in their mission to lure shoppers away from the multi-nationals. The Minister and I are keen to see reduced parking tariffs and offers wherever possible, I am delighted to say the Minister is not to be found wanting in this regard. Ulster Unionist prospective Council Candidate for Newtownards, Richard Smart, said: “I feel Newtownards is somewhat of a rare breed in the shopping arena due to the high quality of the long standing retailers so many people are loyal to.